I love participating in group challenges, and one of the newest groups I've joined is When Colors Collide -- a group of wonderful people who complete a nail art challenge every two weeks with a certain selected combo of colours! This week we did a colour combo that really inspired me: pink and brown! 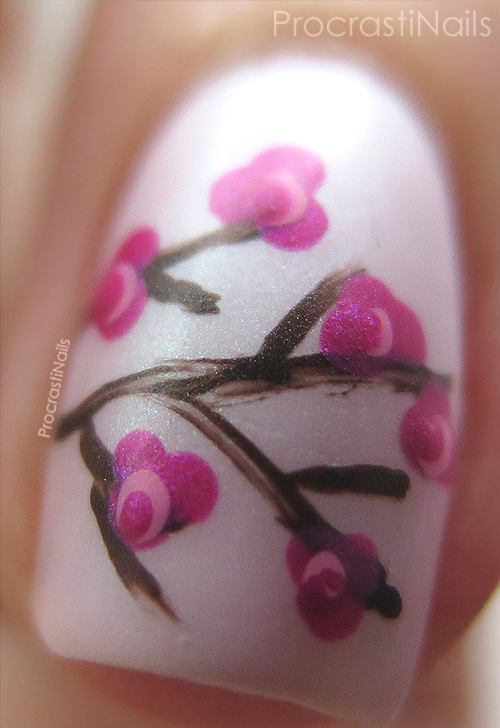 I've wanted to try my hand at a cherry blossom-type design for a long time and this was the perfect opportunity. Check under the cut for a breakdown of how I put this look together and some extra pics! Okay! So if you're curious about how I did this look (even though personally I think it's pretty obvious the steps I took haha) I'll say that I started off with a base of Quo by ORLY Always Chic and when that was dry I freehanded on some branches with my fav brown polish which is Essie Little Brown Dress. Then I used a dotting tool and did some clusters of pink with Essie Can't Filmfest and then dotted the middle of those clusters with a lighter pink (Essie Delhi-Dance) and then finished it off with a final dot of the darker pink again. Super simple! To really finish things (and because I love putting matte on top of freehanded work) I put a layer of regular top coat over it to dry it all and smooth it, and then put a single layer of NYC Matte Me Crazy top coat. It really brings out the shimmer and makes the whole thing look super soft imo! I really had no idea how to make the blossoms but I'm pretty happy with what I ended up with! I thought about adding some tiny white dots to the middles but it just looked too busy. I think I like it better this way, anyway! 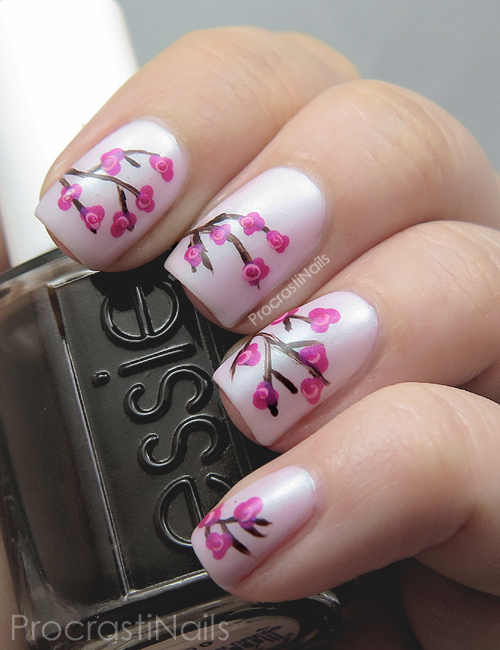 Have you ever tried to do a cherry blossom design before? What do you think about this one? The shimmer is so delicate and pretty! And I love the mani! I was so sad to miss this prompt, pink and brown has always been a favourite combo of mine. This is stunning and your macro is to die for! I love cherry blossom anything. Cherry blossoms are always so lovely and delicate. You did a beautiful job with these! I am so drawn to this base color. 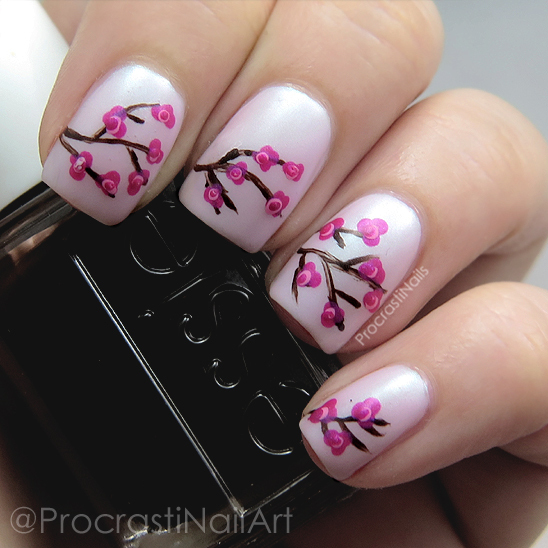 I love cherry blossoms and your nail art turned out great! Ah! You're inspiring me to do this! I used to do cherry blossoms a lot, in my pre-blog-era. It's so fun! Yours turned out so elegant! I am loving this mani! From the base color to the design, it's so pretty!